The taste of these baked pork ribs explodes in your mouth and awakes every taste bud of yours. Every time I make this dish, I find myself have to lick every bit of the ribs since I don’t want to lose any of the delicious sauce on the ribs. 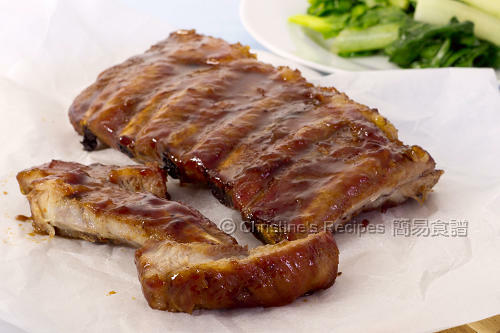 To make moist and succulent ribs is quite challenging. There won’t be any fat or too much meat on bones, as a result it can be dried up very easily along the way of baking. Fortunately, there’s an easy work around for making wonderfully tasty and succulent baked American ribs to entertain your family. Tips are shared below the recipe. These oven baked pork ribs perfectly go with steamed rice. Rinse pork ribs and wipe dry. Mix with marinade well. Store in fridge with cover, at least 2 hours. Preheat oven to 180C / 350F. Remove pork ribs from fridge and rest in room temperature for about 20 minutes. 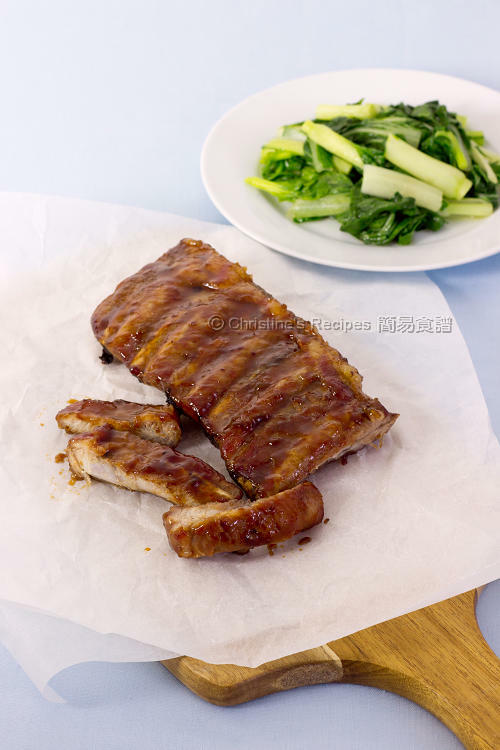 Transfer pork ribs into a ceramic baking tray. Top side faces down. Put all the marinade on top of the ribs. Cover with foil and bake in the preheated oven, for about 30 minutes. Remove the foil. Turn the other side of ribs over. Spoon the sauce over the top. Continue to bake for another 15 minutes, or until the sauce reduces by half. Brush honey on top. Bake for another 5 minutes. Remove the ribs from oven. Let the pork ribs rest for 5 minutes. Cut the ribs and serve immediately. As American ribs don’t have any fat or much moist, they could be turned really dry easily. Here’s a trick to help produce moist and succulent baked ribs. Simply mix in some water into the marinade and let the ribs absorb more moist before cooking. The material of baking utensils used is very crucial as well. Use ceramic or oven-friendly glass baking dish. The sauce inside won’t dry up too quickly. If using metal baking tray, keep an eye on the ribs towards the end because you don’t want to lose or burn the delicious sauce. Yum! Definitely have to use your fingers to eat this as it is finger-licking good! the pork ribs looks delicious, wish I can have some now. Thanks for the tip on adding water to the marinade! I always worry about the rubs turning dry. Great recipe, thanks for sharing. Yummy!... I can have something for dinner tonight. Thanks. I might not be good at licking every bit of ribs, but this looks so good that I'll try my best. yum! I'm always on the lookout for quick and easy ribs recipes! Definitely going to try this one day...thanks for sharing! I will eat and lick them on its own! :p No rice required. This dish sounds amazing! Wish I could dig in , right away! I love pork ribs, yum! Hi Christine is it freshly grated ginger or ginger sauce/juice? I used freshly grated ginger juice. What is the substitute for ground bean sauce if i dont have any? Both of the taste and smell of ground bean sauce are quite unique. Sorry, can't find any substitute. So hard to find American ribs at all the Asian grocer places (ie springvale/richmond) where do you get yours Christine? You might try to get spare ribs from supermarkets. It'll work. Hi Christine, does the cooking time remain at 40 mins if I have 900 g of ribs? The cooking time of ribs won't be much different as the thickness of the meat is quite even as long as you have a large oven and a large baking tray. You might need to move the ribs around in the middle of baking process so that all the ribs get evenly heated. Hi Christine, May I know where can I get American Pork Rib? It is not the same from what we buy from the Market? You can get it from a market or a butcher. Ask them to cut out the pork ribs for you. Those deliciously stickily ribs do look very tender and juicy! Can ground bean sauce replaced with peanut butter. Both of them are very different. I don't think peanut butter will work with this recipe. Yeah, we call it "American ribs" here in Australia. No idea why it's called so. Thanks for your suggestion. I've got quite a lot of readers from US. It's good to let them know to get baby back ribs if they want to try this recipe. These look SOOOO. Must try this! Hope you'll like it as much as we do. Happy cooking, Heather.